Ever wanted to go on a new adventure? Well, you should probably ask Rango - a chameleon that has a habit of telling tall tales in order to get his way - because hes got plenty of ideas. In the upcoming blockbuster movie, this colourful character spreads wild stories about his past in order to win the respect of the people in Dirt, a town from the Old West. The reason? Rango wants to become the sheriff, and only in telling people of his non-existent, courageous endeavours can he earn that title. 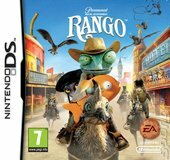 This video game adaptation follows the same premise as the film, but instead puts you in the shoes of Rango as he acts out his fantastical adventures. Your journey starts in the dusty Wild West, and sees you tackling serious foes - and measly rodents - intent on destroying the town. As the noble hero, you can either take down these enemies using your gun or a melee attack to collect stars which act as the games currency. As you progress and boost your abilities using the skills upgrade system, youll be taken throughout many more weird and wonderful locales. One moment youre in a reasonably token wild west scenario, the next youre fighting off zombie rodents and even jumping into old-school arcade machines.